Last Thursday I (Cat) attended An evening with Cassandra Clare with Jamie Campbell Bower and Sarah Rees Brennan as special guests and before the event officially started, TMI Source was able to ask Cassie a few questions. We were incredibly lucky to also have Sarah Rees Brennan – co-author of The Bane Chronicles – and Joshua Lewis – co-author of The Shadowhunter’s Codex and Cassie’s husband – in our interview! So Cassie, thanks very much for agreeing to this interview with TMI Source. Our first question is: Before Magnus was cast you were very insistent on an Asian actor – I still remember your London signing last year – and are there any requirements for the actors in City of Ashes and are there scenes that absolutely have to be in the film? Cassie: Clinging together, locked in an embrace in the bottom of a boat. The first and only time that ever happens. But it’s the first time that Jace really prioritizes Simon and someone who is important to Clary is someone important in general. So I really – I hope that they not, in any fit of homosexual panic, cut that scene out because it’s great. Cat: It would also be lovely to see Alec and Magnus on the truck and of course the Seelie Court. Cassie: Oh of course! I should have mentioned that! I’m just not concerned because I know that the screen writer is really invested in Alec and Magnus’s relationship so I feel like it’ll be there, but I really do wanna see the scene on the truck where Alec says “Take my hands, take my strength.“ I really hope that makes it [into the movie]. Cat: That would be great! So, the ending of Clockwork Princess was bittersweet and surprising because not many characters died. And you said that there are worse things than death. Will ‘worse things than death’ happen to the Mortal Instruments characters or will they be truly dead and what awaits the characters in general? Cassie: I think that there is a certain bitter sweetness about Clockwork Princess that is very different from City of Heavenly Fire because Clockwork Princess deals with a main character who is immortal and I find the writing about characters who don’t die and live forever that there is an innate tragedy – I mean Schopenhauer said that immortality is the perpetuation of a great mistake – and so I feel like there is this great mistake that is sort of a bit of a curse that reflects Tessa and Magnus and the people that they love they’re gonna lose and so that really was what the end of Clockwork Princess was about. I mean, we lost Jessamine which was sad, but it was one of those situations where people would always asked me “Is Will gonna die?” and I thought, “Well, yeah.” I mean, he does. He dies in the book, he dies on the page. But if I say yes you are gonna think that I mean something completely different from what I mean, because while Will dies and we see him die, he lives a complete, full life and he dies when he’s 80 years old or something. Cassie: But right, but it is sad! So it was a difficult question to answer and I felt like it was one you couldn’t answer without reading the book. And I feel like with City of Heavenly Fire, because the characters are mortal it’s much more immediate, their loss is immediate, their experiences are immediate and so I think it is sad, there are certainly some losses because there’s a war. It’s going to be affecting in a different way. Cassie: I was like, If I skipped ahead when Jace was 80, it would be like 2090 and Clary would be like, “Well, the robot overlords who rule our world are very sad about your death.” I was like, I don’t want to write science fiction so we’re not going to go that far ahead. Sarah: You can come sit here while you two discuss working together in marital harmony. Cat: It’s actually great that we get to ask you for this interview. So the Shadowhunter’s Codex will be released on October 29 and you worked together, and do you know as much about the Shadow World as Cassie and what will we read in the Codex? Josh: Well, do I know as much as you about the Shadow World? Cassie: You know more about some things. Josh: You know about things that haven’t happened yet and haven’t written yet. I know a lot now, when I started I took copies of all of the books and I spent about a month just putting post-its flags in them, just flagging everything that was interesting from the books, that was sort of world building things. Cassie: They’re color-coded, I think. Cassie: Green for mythology, blue for monsters, purple for weapons, you know. Josh: Yeah, it got very elaborate. I guess what you expect to see is a lot of organizing information that you will know from the books, things that are not actually in the books and just sort of extra information that doesn’t show up, because it isn’t relevant to the main characters. A lot of really beautiful art, I’m very excited about the illustrations, and quite a lot of handwritten notes from a few of our Mortal Instruments characters. Cassie: Yeah, it’s Clary’s copy of the Codex and so it’s got her comments. Cat: Ok, fantastic! Now the last question because we’re running out of time. You’ve sold over 23 million copies all over the world and if you had the chance to go back to the point before you started writing City of Bones, what would you tell your younger self? And would you tell her to do anything differently? Cassie: Oh goodness. I mean, I’m sure that I would tell myself to change little things and to correct little things and that kind of stuff, but I think that I would tell myself to – you know we writers, we have a bad habit of whenever we open a book we see a problem, whenever we hear something negative about the book that’s what we focus on – and I would try to tell myself for every bad thing you’ll hear 300 wonderful things from fantastic people like you guys and people on Tumblr and not to only remember the things that are bad. Take the time to appreciate the things that are good! That’d be my advice to me! Cat: That’s a great advice! So, thank you very much for this interview! Thank you to Cassie, Sarah and Josh and also huge thank you to Cassandra Clare’s publicist Sarah and all the lovely people from Waterstones who made this day very special! Cat, you are so great! Thank you for doing this! Great questions! A really well thought-out interview, Cat! Thank you, Sandra! 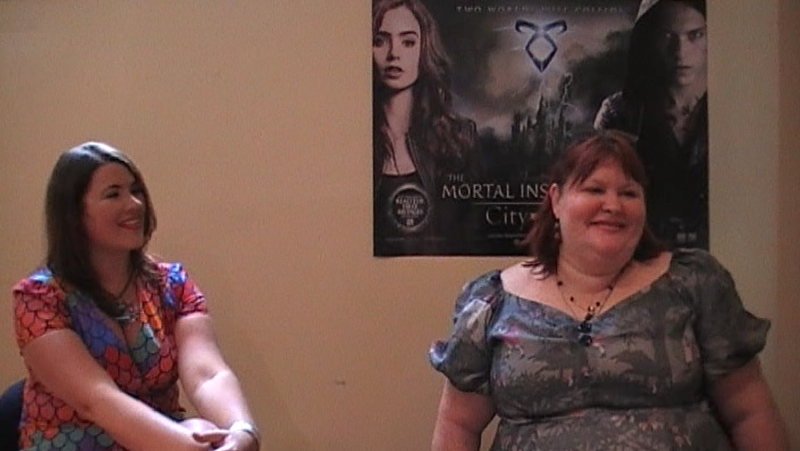 It was still amazing to interview Cassie, Sarah and Josh! Cat, it was a wonderful interview! Thanks! Great job! Thanks for posting the text, easier to understand a fast passed talking like Cassie. IF JACE DIES, I WILL BURN YOUR BOOKS CASSIE! I MEAN IT.